Developers often use code samples from code repositories that are produced by other developers. It's a common practice, but it's not always as seamless as you might expect, as it's difficult to pass content to a search query and get the right results. Bing announced the Bing Code Search Visual Studio extension, a collaboration between Visual Studio and Microsft Resarch. 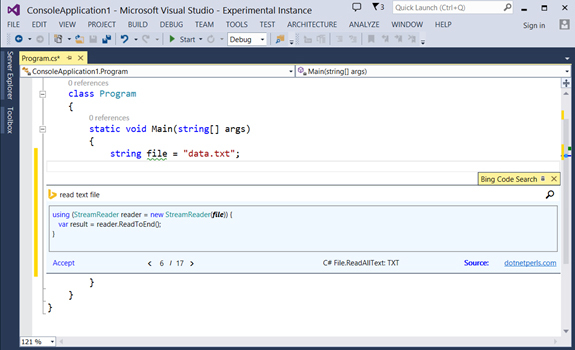 The extension helps devs find relevant code samples from within Visual Studio and provides that ability to review the code without leaving the code editor. The code is sourced from repositories including MSDN, StackOVerflow, DonnetPerls and CSharp411. Bing indicated it uses signals and metadata including project type and semantic content (e.g. C#/VB Compiler) combined with its index to deliver relevant samples directly into Visual Studio.